How do you know you are getting the bankruptcy lawyer you deserve? We are not an assembly line. We believe you deserve quality service, which begins with a lot of face-to-face time between the lawyer and client. You will not get a handshake from a lawyer and then spend all your time with an assistant. We think our way is good business, and the professional way to practice law. This commitment to quality is reflected in the opinions of our clients and other lawyers. Most of our clients come from referrals from clients and other lawyers. They know the quality of our work. We get those referrals because we do what it takes to produce happy clients and successful cases. We have a single-minded focus on bankruptcy and debt relief. Other lawyers in the firm handle other matters -- divorce, criminal defense, business matters -- but Steve and his assistant Dawn focus on protecting our clients from their creditors. You deserve a lawyer who isn't trying to be good at several different things. 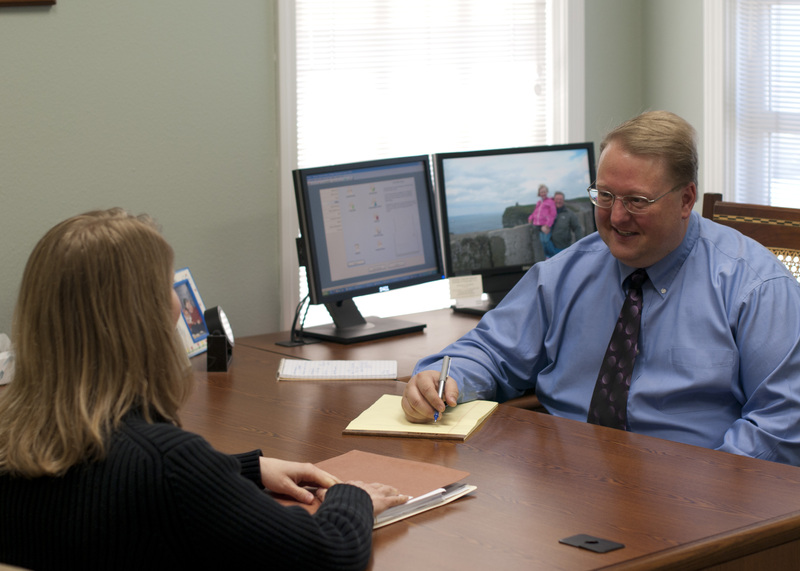 Steve has been representing clients in bankruptcy since the early 1990's. A lot has happened in the meantime. We've represented a lot of ordinary folks with ordinary debt problems, and we love doing it. But we've also pushed some boundaries. We have always been up for a challenge, whether it is filing a bankruptcy for a client while living in Africa, or proving that a beach home in southern California can qualify as an Iowa homestead and be protected from creditors. And while ours is a business, we do things that often are not profitable, too. When a local lawyer skipped town leaving his clients unrepresented, we stepped in and represented those people free of charge. When clients have a hard time raising money to hire a lawyer because of garnishments, we routinely agree to file those cases with no money down. We also help people with big student loans, which many lawyers will not do because those cases are difficult, time-consuming, and generally not profitable. We have had a lot of success with student loans. We like winning, and we like helping people. It's not always about profit. At Johnston, Stannard, Klesner, Burbidge & Fitzgerald, you will get professional service, but in a casual atmosphere. Just because we're lawyers doesn't mean we like wearing suits. Our first-time visitors also find their expectations blown away by lawyers in jeans and a dog wandering the office. This is how we choose to practice law in the 21st Century, and we hope you will agree to visit us if the need arises. Contact Steve by calling his Iowa City office at (319) 338-9852, or from Muscatine call (563)263-8801. Or send him an email by clicking here. Steve is a partner at Johnston, Stannard, Klesner, Burbidge & Fitzgerald, P.L.C. Visit the firm's website at www.iclawfirm.com. The purpose of this website is to provide some basic information about bankruptcy law in Iowa so that consumers will be better able to discuss their options with a bankruptcy attorney. You should never rely on a website or any other general information. Rather, you should meet in-person with a lawyer for advice that fits your situation. Filing a Chapter 7 or Chapter 13 bankruptcy case will stop foreclosures, repossessions, and garnishments. You will find information in this site about what bankruptcy case and cannot do for you, and you are encouraged to speak with an attorney about the details of your situation as soon as you are aware of your financial difficulties. If you want more detailed information than is contained in this site, or you want to begin preparing for a meeting with an attorney, then call (319)338-9852 to request a Common Questions brochure and a Questionnaire (or use the links on this page), or to set up a cost-free, obligation-free consultation. Keep in mind that the information in this site is intended for persons who are considering filing for bankruptcy relief in Iowa. Residents of other states should seek advice from attorneys licensed in those states. * While we serve clients statewide, for those wanting a Chapter 7 and Chapter 13 bankruptcy attorney with an office in central Iowa, Jeff Mathias may be able to help you. His website is found here: www.iowabankruptcyguide.com/. For a FREE EVALUATION of your case, open the documents from the links above. Or call (319) 338-9852 to talk to Steve. The past seven months of paystubs for you and your spouse, even if your spouse isn't filing (but not if you are separated). If you don't have all of them, your employer should be able to print a report summarizing your income. The past two years of tax returns, complete with W-2s. If you can't find them, we can help you get them. Permission to order a credit report. The form is available above. Copies of any bills and collection letters. We need to know about ALL of your debts, including ones you want to pay. Let us know if you have had income in the past six months other than wages. Examples: self-employment/business, child support, unemployment, worker's compensation, Social Security, rental income, inheritance, pension. Any document showing the value of your pensions or other financial investments, including cash value life insurance policies, college savings accounts, stocks, bonds, etc. We invite you to submit your questions or comments below. Or email us here. This web site is designed for general information only. The information presented at this site should not be construed to be formal legal advice nor the formation of a lawyer/client relationship. Persons accessing this site are encouraged to seek independent counsel for advice regarding their individual legal issues. We are a debt relief agency. We help people file for bankruptcy relief under the Bankruptcy Code.